And when you have a disability, giving thanks for everything we have is a big deal as a citizen of the United States. First and foremost, we have a little thing called the ADA. I am hugely grateful for this, as we all are. I can’t imagine what it was like before it was enacted. The feeling of helplessness a person with a disability felt must have been so strong. Luckily, I was injured two years after the ADA was signed into law. Another thing I’m grateful for may seem a bit obvious, but it’s a necessity all wheelchair-users must rely on – my wheelchair. When I was stuck in bed for a month after first breaking my neck, I got a good taste of what life is like without a wheelchair, and it wasn’t pretty. My power chair is my freedom in more ways than one. I’ve had a lot of power wheelchairs over the past 20 years too, and my current one is my favorite yet – an Action MK3i SPJ powerchair with an elevator seat. It zips really fast, gets me where I need to go easily and the elevator seat is a godsend – helping me see around people at concerts and sit at bars with my friends. If you’re not grateful for your wheelchair yet, try donating to Wheelchairs for the World, a non-profit that delivers thousands of wheelchairs to people worldwide. Many people in other countries would give anything to have a wheelchair, let alone one that is powered, and they spend most of their days in bed, not truly participating in life. My wheelchair to me used to represent a symbol of weakness, but I now see it as a symbol for my legs and for getting around independently. Never forget how lucky you are. Good friends and family are another important thing in my life. I’ve had so many friends and boyfriends come and go over the past 20 years that it can make you feel a bit dizzy; hardened too. So many able-bodied people have a hard time getting used to our disability; that’s the truth of the matter. So if you have even one friend that loves and supports you 100%, don’t forget how lucky you are either. The same goes with family. Not all of us hit the family jackpot when we’re born, but if you did like me, don’t ever forget to count your blessings. A family that is there for you when you need them as a person with a disability can make such a difference in one’s overall happiness. My mom, dad, sister, brother; I can call any of them if I need help, and I love them for it. I’m also thankful for my van. After years of riding Metro Mobility, a local disability transportation service, as well as riding the city bus, I finally got my own van and learned how to drive in 2005. Hands down, getting my ramp van and driver’s license has been one of the greatest things to happen to me as a quadriplegic. Being able to go where you want, when you want is HUGE if you’re paralyzed. I also can’t forgot one more thing – good health. If you’re not battling any skin issues, UTI’s, weird rashes or whatever else a person with a spinal cord injury might encounter, don’t forget to count your blessings in this department too. Good health is the most important thing at the end of the day. Always has, always will be. Be thankful for that first and foremost, and you’ve got your thankful ducks in order. 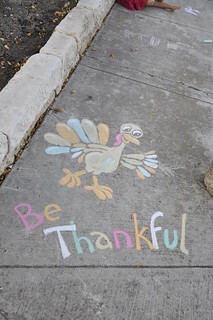 What are you the most thankful for this year? Transportation is one area of my life where I do not have the independence I wish I had. My husband and I live in a rural area, where buses and other public transportation are not available. Therefore, when I want to go anywhere, I have to ask my husband, my parents or my friends to drive me. This really inhibits my ability to do what I want, when I want. Physically, I am capable of driving, but learning to drive has been a huge challenge for me, a challenge that I have struggled to overcome for the last 15 years. I have worked with almost every agency available to reach this goal, but it has never worked out. Every agency has wanted me to accomplish my goal in a certain amount of time, and when I couldn’t do that; I was told that I couldn’t do it at all. For a while, I accepted that. Then one day, I decided it was crap, and so were all the agencies I had been working with. Legally, I didn’t need them to learn to drive, so I decided I was going to do it one my own. I took and passed driver’s education in high school, so in June, for my birthday, I went to the secretary of state and applied for my driver’s permit, for the fifth and what I hoped would be the last time. Then I purchased some temporary hand controls, my husband put them in the car and I was one my way. Learning to drive on my own has been a lot harder than I expected. I need to practice, a lot. In order to do that, I need people to take me driving. My husband, kind of sucked at it at first, he would freak out at the slightest mistake, and his yelling would make me so nervous and stress me out so bad that I would end up crying when I finally parked the car. He didn’t mean to yell, or upset me; I knew that, but I still took it personally. I started to hate driving. For while, I tried to drive with other people; but schedules limited my ability to practice. So my husband and I tried again. He has gotten much better and I am starting to improve as well. I still lack the confidence it take to drive well. I wish I could buy that online. Unfortunately, I am told that it will only come with time and practice. I am probably going to have to apply for that permit at least one more time; it expires in December. I am nowhere near where I thought I would be at this point, and I can’t help but feel a little discouraged. I do not want to fail at this, so I can’t give up. I have to keep trying. No matter how long it takes me, I want to have the independence that driving can bring me. I want to go where I want, when I want and to live my life unlimited. Some people eat ice cream or watch Superbad to get happy, I on the other hand have found a much more visceral dorm of happiness – I drive my minivan. When I finally got my driver’s license at age 25 (a very daunting task for a C5-6 quadriplegic mind you; tons of extra gadgets to get the hang of), my eyes were opened to the therapeutic benefits of getting where you want to, WHEN you want to. No limitations. The same as everybody else (something you rarely get when you use a wheelchair). Every time I get behind the wheel my disability visage transforms into just another car on the road. I love it. And although yes, it is a modicum of independence, the adapted minivan (the minivan combined with the lowered floor and ramp) is no small purchase. With a base price (new) of $35,000 (and that’s on the low end ) lots of folks just don’t have this kind of money. Buying a used beater, the birthright for most first drivers, isn’t an option for us. This is especially not cool since so often people with disabilities can have a harder time getting employed. Workplace discrimination is a sad but true reality. So…we struggle make enough money AND our vehicles cost more. Great. I had a hard time figuring out funds myself. Thanks to help from my family, I ended up purchasing a used 2006 Dodge Grand Caravan (1 year old) from a rental car company for $12,000. We figured that was a wise move. And I was fortunate to have my health insurance cover the installation of the Braun lowered floor/ramp; a huge expense I was worried about (it costs much more than the van itself). I was hugely lucky. But, not everyone is this lucky. I know hundreds people with disabilities both in person and online who desperately need a van. They want to get one, but don’t have the funding. Many of these folks search and search until they find a used one they can afford (but not often though). Others throw a benefit for themselves to raise the money. This can sometimes work, other times not so much. And others just give up. I really hope adapted vehicles came down in price one day. At least we have newly adapted vehicles like the MV-1, the first adapted vehicle to be made on an assembly-line from VPG, which has greatly lowered the base price. And I drive from my wheelchair. Yeah, I stay in it. And boy is it sweet. This by far is my most favorite adaptation in my van, and it’s made possible by my EZ Lock automatic chair tie-down system; a slick contraption that keeps my wheelchair in place as I drive. I just drive my chair over it and hear for the “click” (to know when I’m locked in). Such a great independence-enabled thing. Automatic tie-downs truly are the only way to go. As I do get locked in and turn on my van, feeling it purr…a flurry of endorphins 9 times out of 10 inundates me. This feeling cannot be topped by anything else in my life. Shopping, traveling, my boyfriend even, nothing. And when I bring my minivan up to speed on the freeway, nothing can beat that stronger and stronger feeling. My unresponsive body is no longer a factor at that moment. Not behind the wheel. The car responds to me and that is all I need. And OMG oh what a feeling. Thank you, my sweet Silver Bullet, my Dodge Grand Caravan, for bringing me the feeling of limitless joy. What do you drive? And what kind of adaptations do you use?